Well here we are. 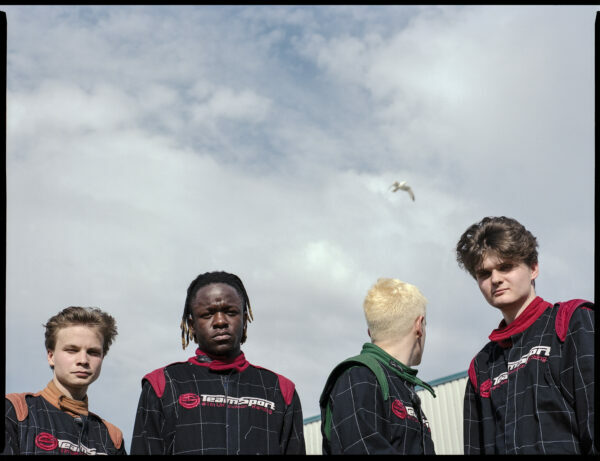 The UK’s most talked about band, Black Midi, have announced they have signed to Rough Trade Records. In a familiarly nonchalant Facebook post from the group, they stated “signed to rough trade records more tracks and that coming soon .” Also in pretty unconcerned fashion, the band have shared the 12” version of their new EP ‘Speedway’, a live favourite that the band have been selling as an exclusive physical while on their UK tour. It all leads quite smartly to the track itself, a more considered, smarting take from their incomprehensible live set that seamlessly forms into what we can only loosely call a conventional “pop song”. Weighted with spine-tingling pinch guitar and the fragmented warping of Morgan Simpson’s drumming, it’s unsettling how loose and at ease they sound, ensuring you are braced for something incessant. When Cameron Picton takes vocal duties his lyricism belies a sense of improvisation with a clever wink, hinting at a bigger picture within, even when he’s reading the day’s football scores within swathes of thick distortion. Here, the prose is delivered with a whispered drawl, undefined in its meaning yet still managing to feel encompassing. As the buzzing track builds forebodingly towards something harsh and unforgiving, it ceases, showing once again how Black Midi will remain and always have been in control of what their next step is. Header photo by Dan Kendall.